In the desire to repackage and regenerate, music seems to be relying upon somewhat arbitrary anniversaries. Decennial intervals seems to be the accepted time slot, every ten years bringing the sound of record companies and rocks stars heading for the barrels with their chosen metal implement. It is often a case of diminishing returns. Interpol have split the difference and are touring the fifteenth anniversary of their debut LP “Turn On The Bright Lights”. In fairness, they had done the reissue trick ten years on from its 2002 release with a bonus disc of demos and Peel sessions. So here we are in 2017 at Ally Pally watching the band run through the LP from start to finish. I’d enjoyed the LP back in the day, finding it to be an example of the whole being the sum of its parts. Yes, the influences are pretty clearly British post punk but it is carried off with aplomb, the songs are strong and it hangs together well as an album. In those aftermath of the pre-streaming days though, I lost touch with the band’s work. I had a young family. Other artists and more essential items got prioritised. I heard tracks on magazine cover mount CDs (most notably “Evil” from their second LP “Antics”) and they sounded fine. And there you go damning them with faint praise. They struck me as a development of the first LP, but not much of one. As a fan of the bands that were their initial influences, what I heard missed the progression that the likes of the Bunnymen, the Cure, New Order and co maintained through their careers. Alexandra Palace is on my doorstep though and when my friend Mark offered me his spare ticket, I thought I should give it a go. I played back the debut LP in the weeks preceding the gig. It has stood the test of time well, with its sense of post 9/11 foreboding. That New York scene is coming back into focus at the moment. I’m listening to LCD Soundsystem’s rather good new LP as I write this. Lizzy Goodman’s account of the contemporaneous New York scene, “Meet Me In The Bathroom” has just been published. Extracts of the Interpol related chapters were being handed out as freebies in advance of the Ally Pally gig. Singer Paul Banks and guitarist Daniel Kessler had met a NYU Summer School in Paris. They both treated the course with a healthy disrespect and went about putting a band together on returning to New York. It was that cool kids in the class thing, making eyes at each other during a lecture on World War I, as you do. The album was recorded in Connecticut, in the attic of producer Peter Katis’s mansion which hosted Tarquin Studios. Judging by the photos below, the band weren’t exactly roughing it. The band clearly liked their substances and needed to get out of the Big Apple to record. The album captured their version of New York though. Carlos Dengler, the bass player was unhappy. He comes across as an irritant in the account of recording the debut. Having worn dresses and large crucifixes to class in NYU, he progressed to dressing in a style reminiscent of the Hitler youth. His behaviour appeared to be getting under the band’s skin from the start. He hung in there until 2010 but was gone. He appears to be the one key member of the band that didn’t contribute to Goodman’s book, which may tell its own story. If truth be told, I’m not sure that I got that much from the gig. The sound was awful with little bass and a high frequency morass blending the guitar and vocals. We commented afterwards that the “run through the classic album” format can be somewhat dreary. The element of surprise is replaced by a sense of anticipation which has to be delivered upon to work. I saw Sonic Youth successfully deliver “Daydream Nation” in this way at the Roundhouse ten years ago, but they were arch improvisors so that managed to pull things along. This didn’t happen on Friday evening. I’ve seen a few comments on line criticising the venue but, for me, that wasn’t the source of the issues. The band looked great, against a back drop of the austere album cover. 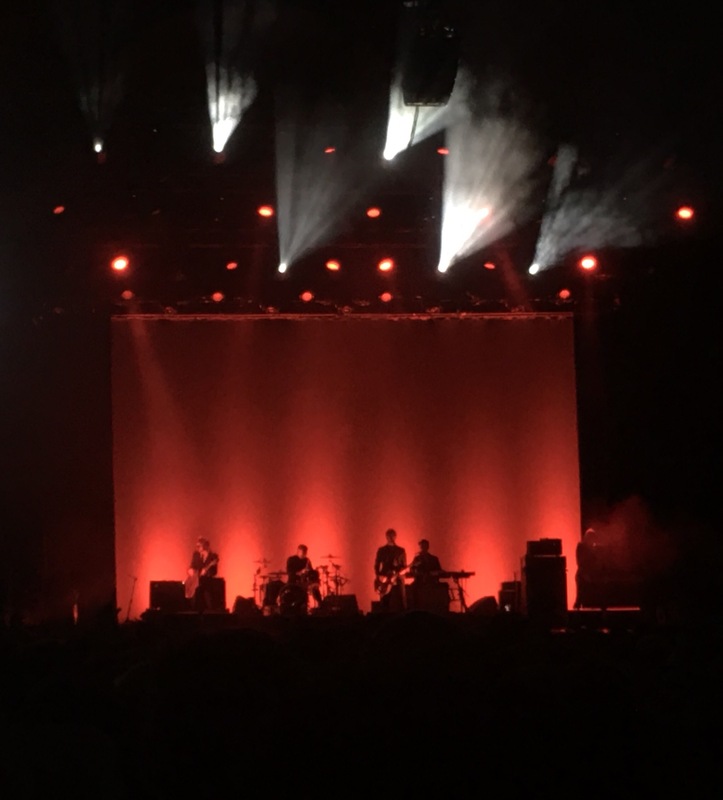 However their lack of engagement, not helped by the absence of video screens, didn’t help connect those either not totally committed to the church of Interpol or sufficiently well refreshed on a Friday evening for it not to matter. As a relatively sober observer, it didn’t engage me emotionally and felt like it was a going through the motions exercise. To hear how they were back in the day, here’s a clip from them playing in the Barfly in 2002. This is “Untitled”, the opening track on the LP and consequently the opening song at Ally Pally. Let’s remember them this way instead.